Bills founder and Hall of Fame owner Ralph Wilson’s military medals for his service in the US Navy will be on display in downtown Buffalo beginning this weekend. Wilson’s World War II medals will be unveiled to the public on Saturday at 10 am at the Buffalo & Erie County Naval and Military Park near Canalside. His medals are on loan for the next couple of months from the Pro Football Hall of Fame. His naval uniform will also be part of the exhibit. Former Bill Bob Kalsu, who is the only NFL player to make the ultimate sacrifice in the Vietnam war will also have a display at the park. His display will include the Sports Illustrated cover story along with his helmet and playing card. Wilson and Kalsu are being recognized as part of the Salute to Service events that will run through mid-August at the park. There was a lot for the players to concern themselves with heading into their season opener. On a larger level than just the game was the fact that it was first game for the team without their founder and owner Ralph Wilson, who passed away this past March. After their overtime victory however, Bills President and CEO Russ Brandon made sure Mr. Wilson’s widow Mary was properly honored. Brandon presented Mrs. Wilson with a game ball in the locker room after the victory. Justin Timberlake had apologies to Buffalo for the postponement of his show back in February. He also toasted the city and the Bills late Hall of Fame owner. Here’s what he said. The Buffalo crowd roared as Timberlake downed his shot. The draft is next Thursday (finally). Here are some of your latest questions from email at AskChris@bills.nfl.net about the draft and other topics concerning the Bills. Be sure to follow our wall to wall draft coverage on Buffalobills.com and live on the @johnmurphyshow, which can be found on the Bills app or locally on WGR Sportsradio 550. In my opinion, Coach Marrone’s biggest mistake in year one was not having an experienced NFL quarterback on the roster to fill in for EJ. Boy, did the Bills ever pay for that oversight. How, then, is it possible that Doug Whaley has NO PLANS to sign a veteran QB for 2014? Can you shed some light on the thinking at One Bills Drive? Because it sounds like a recipe for disaster to me. Also, something I thought to be a no-brainer now looks as though it’s not going to happen……Why haven’t the Bills signed Jim Leonhard?!? CB: I would argue that it was not an oversight. They had Kevin Kolb on the roster. He was supposed to be EJ’s backup, but a preseason concussion landed him on injured reserve two weeks before the season started. The free agent market was a barren landscape of quarterback talent. Fortunately they swung a trade to land Thad Lewis, who is a player the front office and coaching staff is very high on as a backup. He is the reason why they chose not to pursue a veteran free agent option. He’s had a year in the system and he and EJ now have a full time quarterback coach, who by the way worked previously with both of them (EJ at the Senior Bowl, Thad in Detroit). As for Leonhard my only guess is he was seen as an ideal fit in a new defensive system last year that he was wholeheartedly familiar with and could teach to the younger players. Now with the scheme change he may not be seen as quite the same fit. The transition from Buddy Nix to Doug Whaley has seemed to go very smoothly. My question is about Doug Whaley’s basic draft philosophy. Buddy Nix was on record saying he didn’t like to move in the draft, whether it was up or down. I would love to see the Bills move down in the 1st round this year, pending a dance partner, to get more pick(s). There appears to be a lot of talent in the 2nd & 3rd rounds. Do you think Doug Whaley will be more proactive to move down in the draft than Buddy? P.S. I hope 2014 is the year you get to report about more wins than losses! CB: I do think that Whaley is more aggressive by nature to make a deal. He was very honest about keeping all options open with their pick at nine. That includes trading up, which I think is a distinct possibility. We’ll see what happens, but at the pre-draft press conference I was encouraged by this comment from Buffalo’s GM. “If you have a calculated system, and you use that approach, and the deal makes sense, and you see hey, we can move down to this point and still get a guy that we’re excited about, pick up another pick, then don’t be afraid to make the deal,” Whaley said. I saw a rumor going around on nfl.com saying that Houston is “trying very hard to move down to acquire draft selections” and that Buffalo is a potential trade partner. I would like this move and I hope Buffalo goes for the #1 pick. I would love to see them pick up Greg Robinson or Sammy Watkins. Do you think this is a good possibility? Who do you think they would be chasing after to give up picks to make sure they land? CB: I tend to doubt the Bills will move up to the top spot. Even the Bills at nine would have to give up an awful lot to make that happen. That being said I do think that moving up to a spot between 4 and 6 is a possibility if the right player is still on the board for them. There’s no way to gauge the likelihood of that happening because there’s no way to tell whether the compensation offered will be accepted for such a move to occur. I do think if the right talent is sitting there on the board Buffalo will at least make an attempt to make something happen. With the passing of Mr. Wilson how will this affect spending for the organization in the coming months? Certainly, the staff had a license to spend when he was alive but given that his estate needing to be settled, was a plan put into place so the day to day and free agent spending would not have cash limits. I just wonder when a player needs to be paid millions of dollars to sign who writes that check now? CB: As team President and CEO Russ Brandon and GM Doug Whaley said at the pre-draft press conference their operations as a football club are unaffected moving forward. Here are their direct quotes. Does Austin Seferian-Jenkins fit what the Bills are looking for in an athletic tight end? Does he have the speed to be a juke type of tight end? I think he’s the second best tight end beside Ebron. Is he a viable candidate in round 2? CB: He is a round two prospect so I suppose he is an option if Ebron isn’t the pick in round one, but I just don’t see him as a fit for Buffalo. He is a giant man, but he does not have the athleticism of Ebron. Apparently no one else does in the class at the position either. Seferian-Jenkins has above average athleticism for a tight end his size (6’5 ½” 262), but there are work ethic questions about him and some off the field issues. There’s not a lot of wiggle to him after the catch as he generally tries to run through defenders. He’s still a work in progress when it comes to blocking. Mary Wilson, the widow of Bills founder and Hall of Fame owner Ralph Wilson spent almost an hour thanking fans as they made their way through the Memorial Celebration set up in the Bills Fieldhouse Saturday. The first two fans she thanked were Dennis Brown and Regina Moultrie. Brown, who made his way to Canton back in 2009 to watch Ralph Wilson’s Hall of Fame induction ceremony was touched by Mrs. Wilson’s presence as was fellow fan Regina Moultrie, who also felt the display in the Bills Fieldhouse was a fitting tribute. “It feels real good to be a Bills fans today,” said Brown. For those fans that Mrs. Wilson could not personally thank Mrs. Wilson issued the following statement. “I want to take this opportunity to thank Bills fans and people everywhere for their tremendous outpouring of love for Ralph. Their heartfelt condolences and warm wishes have truly been a comfort for me, Ralph’s daughters Christy and Dee Dee, Mary Owen and the entire Wilson family during this difficult time. “Ralph loved his life and he had a great full life that touched so many people in a variety of ways. He loved his family and his many friends. He loved his Buffalo Bills and he loved the fans. Before he passed, he told me that he wanted people to celebrate his life after he was gone. He wasn’t big on tears. And so that’s why we are referring to events such as the one today as “celebrating” the life of Ralph Wilson. Green Bay Packers President and CEO Mark Murphy extended his sympathies to the Wilson family on their loss. Born and raised in Western New York, Murphy was able to relate a bit more to the legacy left by the Bills founder and owner. “The Green Bay Packers extend our deepest sympathies to the family of Ralph Wilson and the Buffalo Bills organization,” said Murphy in a statement. “Ralph was a key leader in the success of professional football and its growth as America’s favorite game. We owe him a tremendous amount of gratitude for his work. He also was a friend of the Packers, a fellow small-market team, as the league evolved its business operations to ensure all teams had firm financial footing to achieve competitive balance on the field. The success of the league is a lasting testament to Ralph’s vision. Eagles Chairman and CEO Jeffrey Lurie was one of the many who expressed his condolences hearing of the passing of Bills founder and owner Ralph Wilson. What Lurie said he valued most was Wilson’s willingness to think outside the box when it came to league matters. “I admired his independent thinking on every issue that arose and will always remember his welcoming support when I came in to the league,” Lurie said in a statement. “He was a great example of ownership based on his love of the sport and especially his Buffalo Bills. On behalf of the Philadelphia Eagles, I would like to pass along my condolences to the Wilson family and to the entire Buffalo Bills organization. 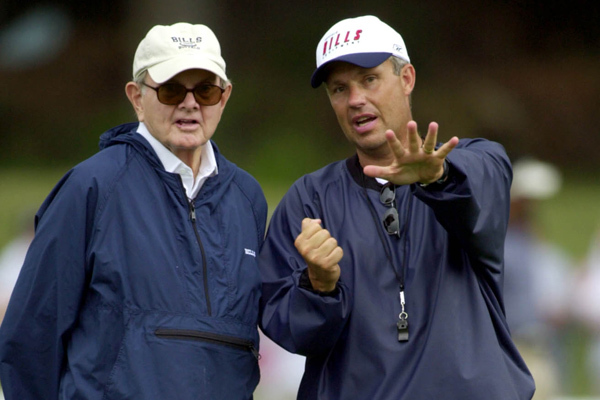 Woody Johnson did not become owner of the New York Jets until 200o, but the first person he consulted upon deciding to become an NFL owner was Ralph Wilson. In an interview with the media at the NFL annual meeting in Orlando, Johnson explained how Wilson helped prepare him for NFL ownership. The Jets owner also spoke of the presence Wilson had when he attended the owners’ meetings and how revered he was by the other owners. Johnson also fittingly called the passing of Mr. Wilson as the close to a special time in the history of football. Bills Wall of Famer Steve Tasker took time to reflect on Mr. Wilson’s legacy in the game Tuesday after news of his passing. Loyal to Mr. Wilson for all he did for him, his career and his family, Tasker explained how much the Bills meant to the Hall of Fame owner. Tasker even got choked up when he thought back to how much Mr. Wilson enjoyed the big victories. “Back in those days when we were winning games… uhhh, occasionally… occasionally when we’d win a big one… it was great… to see what it meant to him,” said Tasker. “He didn’t fake his joy. He didn’t put on a front for how happy it made him. He didn’t make up any emotions to make it look good for any media or any fans. For Tasker even though it was a day he knew would eventually come, it didn’t make the news of Mr. Wilson’s passing any easier Tuesday. Bill Polian would talk with Mr. Wilson regularly, even over the last few years when he was no longer an NFL GM, and there was one conversation that he will cherish in the wake of his former boss’ passing Tuesday. Polian expressed his feelings in a conference call with the Western New York media Tuesday, emotions that most in the region were also feeling. “Obviously I’m saddened. It’s a really rough week for the Bills family because of Mr. Wilson’s passing and Jimmy’s (Kelly) illness. That Bills family includes virtually everyone in Western New York,” he said. “I’m eternally grateful to Mr. Wilson for giving me the opportunity to become a general manager and giving Marv and I the opportunity to build a great football team. I know for a fact during the course of my tenure with the Bills that he had opportunities to entertain offers to move the franchise to places that would be more lucrative. But he gave his word and like everything else he did in his life he kept his word and he said the Bills would never leave Western New York in his lifetime and he was as good as his word. “He was a very kind man, a person that on a personal level, while he was a fierce competitor and a tough boss, on a personal level he cared about you and he cared about your family. There never was a time that I talked to him including recently when he didn’t inquire about the family. He would send us a Christmas card every year always with a note and a kind thought. I’ve often said that if anything ever happened to me, the first call my wife would get would be from Ralph Wilson. The Bills Week 11 game against the Jets this Sunday will be seen on local television. Bills owner Ralph Wilson for the second time this season has purchased the remaining outstanding tickets in time to beat the blackout deadline. Bills C Eric Wood announced the game as a sellout in his weekly radio appearance on Kiss 98.5 with Janet and Nick in the morning. Buffalo was given a 24-hour extension until Friday at 1 pm to lift the blackout. Wilson did the same thing in the last Bills home game against the Chiefs to make sure the game aired on television. Fans can go to select NOCO locations and purchase two tickets for $25 to the game. All ticket proceeds will go to the Wounded Warriors Project during this Salute to Service month. It’s Hall of Fame weekend in Canton, and it’s a special one. The Pro Football Hall of Fame has assembled as many living members as possible for a Golden Anniversary Reunion to mark the 50th anniversary of the shrine. Bills Owner Ralph Wilson took his place among the game’s greats Friday morning, when the Hall of Famers staged a “Red Carpet” arrival on the steps of the Hall in Canton. They then assembled for a group photo, with Mr. Wilson seated among the legendary players and contributors to the game, including former Bills Coach Marv Levy and Quarterback Jim Kelly. Mr. Wilson was enshrined in the Pro Football Hall of Fame in 2009. He returned to Canton last August, to help dedicate the new Ralph Wilson, Jr. Pro Football Research and Preservation Center. And he made a sizable donation this past year to support the Hall in its 50th Anniversary Enshrinement Festival and Golden Anniversary Reunion. Bills President and CEO Russ Brandon made an appearance on the Howard Simon show Monday morning on Bills’ flagship station WGR Sportsradio 550. He was asked for an update on how Mr. Wilson is doing. Brandon said the Bills Hall of Fame owner is glad the doldrums of early July are over and football is up and running again. On day three of the NFL draft, the Bills made back-to-back safety picks in rounds four and five taking S Duke Williams from Nevada and S Jonathan Meeks from Clemson. The choices appeared to be proactive to protect themselves against the possibility of Jairus Byrd not being back with the club for the long haul. Bills GM Buddy Nix indicated that their choices in those two rounds were based on board value more than anything else. To this point Byrd has not signed his franchise tender. Bills President and CEO Russ Brandon is hoping Byrd and the club can reach an agreement on a long term agreement. Brandon also confirmed that the club would like to have Byrd back in the fold.